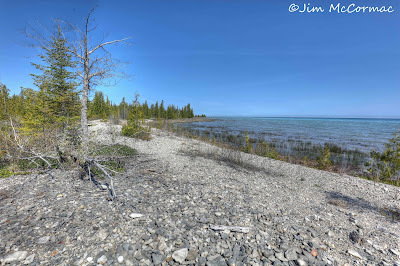 The picturesque shoreline of Lake Huron at Thompson's Harbor State Park, Presque Isle County, Michigan. For the seventh year in a row, I headed to Nettie Bay Lodge to lead a natural history excursion. We had a great time and saw LOTS of stuff - birds, mammals, plants, you name it. Jackie and Mark Schuler, proprietors of the lodge, are fabulous hosts, and as a bonus Jackie's cooking is WORLD CLASS! Just ask anyone who's been. What a perk. If you're interested in coming up next year, contact Jackie or Mark at Nettie Bay Lodge, HERE. We keep the group small, 8 to 10 people. It'll be May 22 thru 26, 2017 (arrive in afternoon on Monday, depart after lunch on Friday). My blogging has been sparse of late, but it's not for want of material. I've got so much stuff in the past month I could write posts daily for weeks. Time has been the problem, and still is as I play catch-up. So, for now, a pictorial slide show of just a few of the northern Michigan goodies from the past ten days. Yellow-bellied Sapsucker, Sphyrapicus varius, female checking on male in nest hole. 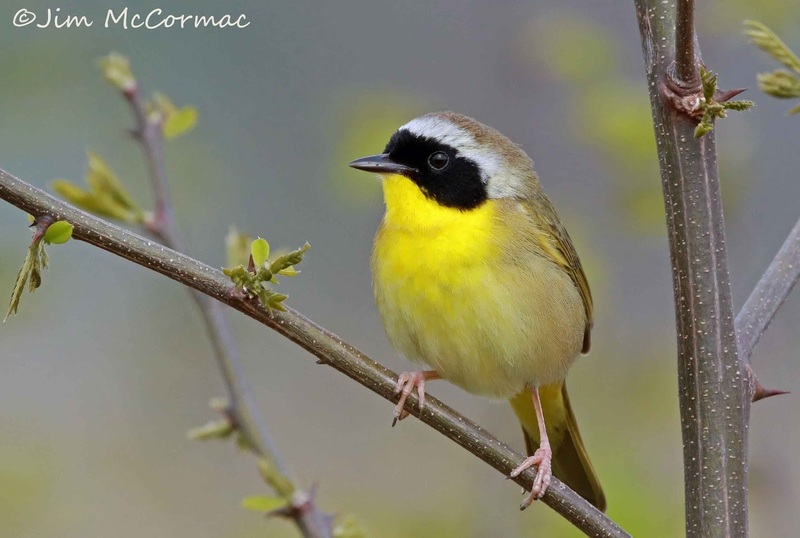 A warbler extravaganza at Magee Marsh Wildlife Area! I spent the weekend up in the marshland region of western Lake Erie, and am darn glad that I did. Saturday was excellent, with many notable bird observations, but none to rival the amazing Curlew Sandpiper that Steve Jones found. The bird was in its breeding finery, and wowed hundreds of birders. Kudos to Steve for producing the 6th Ohio record of this Eurasian vagrant. I've got plenty of photos of the bird, and will try and post some of them here eventually. Sunday dawned COLD - a nippy 35 F at sunrise. Brisk winds didn't make things feel any warmer. As the fabled Bird Trail at Magee Marsh Wildlife Area had seen an influx of birds on Friday evening, I figured that they'd all still be around, augmented by any new arrivals on Saturday night. The migrants would be resting and refueling, building fat deposits and energy for the flight across Lake and on to points north. No one who was at Magee on Sunday morning was disappointed. The birds were absolutely incredible. I've been going to Magee since before there was a boardwalk, and have seen years of bounty and bust. This was BOUNTY with a capital B. Of the myriad birders present that day, I'm sure there were plenty of greenhorns, and they must have been blown away by the spectacle. I know I was. Following is a montage of warblers (I saw MUCH more than warblers!) that I photographed along the boardwalk on Sunday morning. The only camera that I used was the Canon 7D II, coupled to Canon's incredible 100-400 II lens, and handheld. I've probably said it before but I'll say it again - this is one of the best rigs for handheld shooting. A plus is that this lens will focus down to 3.5 feet. Believe it or not, there were times when birds were too close for other photogs to focus on, but my setup allowed me to. SHAMELESS PLUG: If you're interested in learning more about photographic techniques, for birds and many other subjects, David FitzSimmons, Art Weber and I will be teaching a photo workshop at beautiful Lakeside, Ohio on September 20-22. 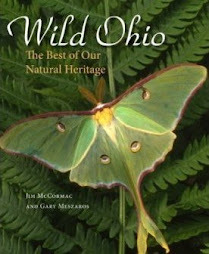 We've got all kinds of cool stuff to show attendees, and plenty of birds will be passing through in their fall transit. Details and registration are RIGHT HERE. An Eastern Box Turtle clambers over a branch in a rich Hocking County woods, last Thursday. 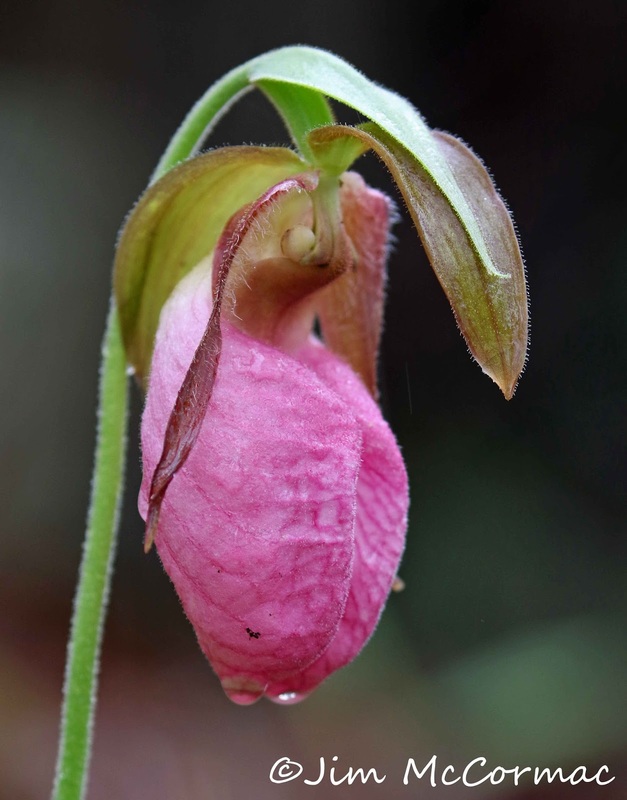 Handsome Pink Lady's-slippers, Cypripedium acaule, provide a photographic flourish. I have covered major ground of late, which is always great, but such travels make it tough to offer up blogs of much substance. West Virginia for a week; one of the best single-day forays I've had in some time (the Hocking County trip where I made this turtle image); a very rare Curlew Sandpiper (thanks Steve Jones!!) 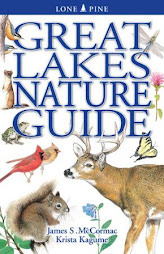 and many other interesting birds along Lake Erie; the best warbler day in recent memory at the fabled Magee Marsh Wildlife Area; thousands of Lakeside Daisies, Tetraneuris herbacea at their finest, eight hours in a helicopter covering what seemed like half the state, and more. 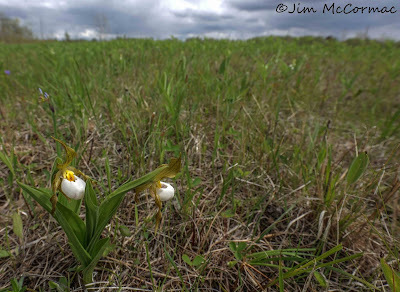 A Small White Lady's-slipper, Cypripedium candidum, vividly punctuates the early spring Castalia Prairie in Erie County. Yellow-breasted Chat, fresh from bath. Hocking County. A stunning male Prairie Warbler peeks from a thorny snarl of blackberries. Hocking County. Next, and soon I hope, will come a montage of warblers from last Sunday's INCREDIBLE day along the Magee Marsh Wildlife Area's Bird Trail. A Henslow's Sparrow bursts forth with its 3/5th's of a second insectlike hiccup. This declining species is a charismatic grassland bird, and one that is much sought by birders. 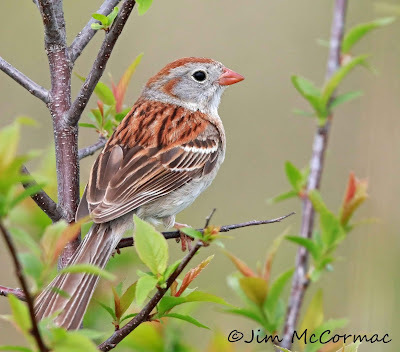 On the weekend of June 17 & 18, the inimitable Ohio Ornithological Society is hosting a grassland bird workshop. Complete details RIGHT HERE. This is a perfect time for such an affair. The birds will be active and singing, the weather should be great, and participants are certain to see lots of avian diversity. Oh, never be put off by the "OOS's" rather distinguished name - it is a very user-friendly bird club that welcomes all skill levels to its ranks. 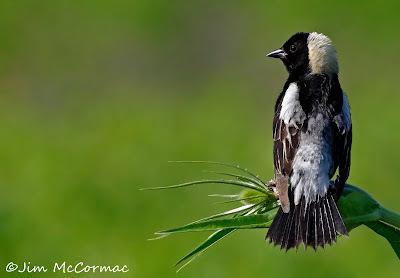 A charming blackbird if there ever was one, the Bobolink. Even William Cullen Bryant was so moved by the effusive gurglings of this species that he comemmorated it in a poem, Robert of Lincoln. Our venue for field trips is the Wilds, a vast southeastern Ohio grassland that hosts more Bobolinks than one can shake a stick at. I've been there, at times and places, when their collective R2-D2 squeaks nearly drowned out lesser singers, such as the aforementioned Henslow's Sparrow. 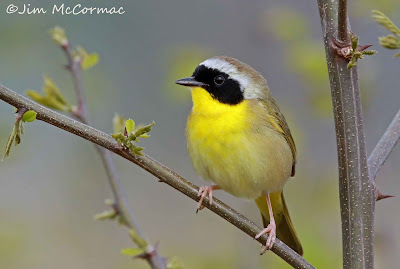 A Common Yellowthroat, the masked Zorro of the warbler world. While not strictly a grassland bird, yellowthroats and many other species occupy wetlands and shrubby copses interspersed with grasslands. The Wilds supports a great many bird species, and this is one we're sure to see. 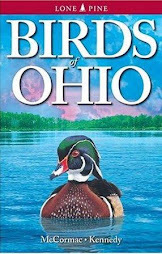 Festivities begin Friday night, with your narrator giving a program on grassland birds and their status in Ohio. The following morning, it's off to the field to see the real deal. A cookout should make for a fun lunch, then its back out for more birds. Sparrows, like this Field Sparrow, may be subtle but they're stunning upon close inspection. We should have ample opportunity to not only bone up on visual identifications, but also practice our birding by ear. I hope you can make it, and if so, I'll look forward to sharing time afield. Again, all the details and registration info are RIGHT HERE. 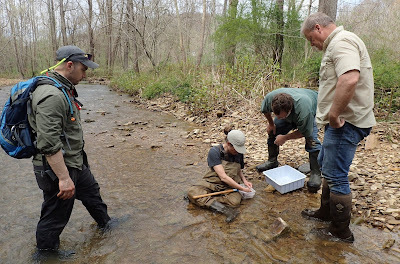 As has been the case for nearly a dozen years, I'm spending early May down in southern West Virginia, leading field trips for the New River Birding & Nature Festival. Despite some rainy weather today, we're having a great time and seeing LOTS of interesting animals and plants amongst some of the most scenic habitats east of the Mississippi. Put this event on your calendar for next year. A Swainson's Warbler peeks from a dense rhododendron "hell". 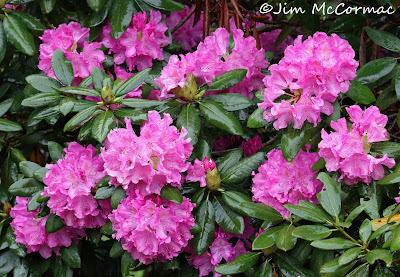 Extensive snarls of Great Rhododendron, Rhododendron maximum, grow along mountain streams in this region, and the warblers are locally common. While Swainson's Warbler may be the least distinguished visually of our warblers, they have a wonderful whistled song that is reminiscent of a Louisiana Waterthrush. 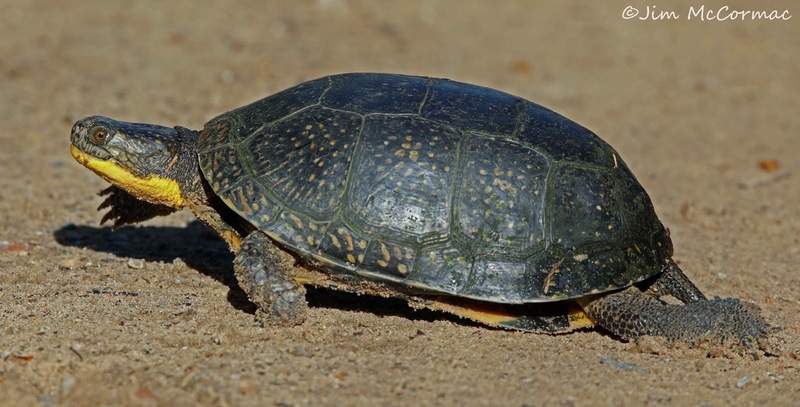 Because of its rarity, the Swainson's attracts many seekers. Only the Kirtland's Warbler is rarer amongst our eastern warblers. I found a Brown Creeper nest a few days ago at Cranberry Glades high in the Monongahela National Forest. In this image, the animal is bringing nesting material to place behind the exfoliating bark of this dead yellow birch. The nest entrance is the v-shaped gap by the creeper's tail. Our group today was pleased to find the Pink Lady's-slipper, Cypripedium acaule, beginning to flower. The high oak-carpeted ridges of Babcock State Park have plenty of these exotic-looking orchids. An exceptionally showy specimen of Catawba Rosebay, Rhododendron catawbiense, warranted a photo. It was one of four native species of Rhododendron that we saw today.